In September 1972, Guillermo Rios stepped off a plane in Madrid, Spain and began realizing a life-long dream. A graduate of the University of Pennsylvania in Philadelphia, he received his degree in English Literature in 1968 and was subsequently commissioned a second lieutenant in the United States Marine Corps. By 1972, Captain Rios had completed two long combat tours in Vietnam and recovered from his wounds. He arrived in Madrid at the age of twenty-six armed with fluent Spanish and a burning desire to learn the flamenco guitar. Guillermo's principal teacher was Juan Maya "Marote" - an artist of legendary knowledge with an incredible delivery. "Marote" immediately declared that a twenty-six-year-old beginner could progress as far as anyone else and that Guillermo would be able to start working as a flamenco guitarist within two years. The only precondition was that Guillermo had to faithfully execute every detail of the maestro's instruction. Less than two years later, Guillermo was allowed to play alongside veteran musicians in Madrid's flamenco clubs where he began to accrue the enormous skills required of every professional. For the next eight years, Guillermo worked the requisite seven-nights-a-week in the clubs: Torres Bermejas, Arco de Cuchilleros, and five continuous years in Las Cuevas de Nemesio. He was then hired to tour Spain, Europe and Canada with the prestigious companies of Carmen Mora, Manolete Maya (Juan's brother), Mariano Torres and Ricardo El Pelao. He continued to study with Juan Maya - now his son's godfather- as well as with Pepe Habichuela. Counting the great Sabicas among his intimate friends, Rios constantly and respectfully grilled him about the art of the flamenco guitar. In 1983 Guillermo joined the Maria Benitez Dance Company and was her leading guitarist and musical director for five years. Since then, he has appeared with every major Spanish dance company in the US, notably those lead by Jose Greco, Jose Greco II, Rosa Montoya, Jose Molina and La Tania. Together with Rosa Montoya, Guillermo was awarded a grant for new music from Meet the Composer in New York. This was the first time the committee had ever awarded its grant to a flamenco guitarist. 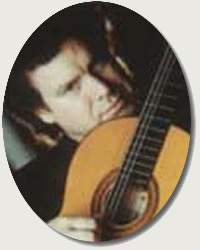 Concurrent with his ensemble activities, Guillermo also developed a solo career and in 1983 was awarded a Canada Council Arts Grant for compositional studies with Pepe Habichuela. Guillermo has given solo concerts with his friend and teacher Juan Maya and with Mario Escudero throughout the USA, Spain and Canada. In 1991, Guillermo became a member of the quartet Festival of Four, formerly known as A Festival of Strings. With this group he had the good fortune to collaborate for four years with Emanuil Sheynkman, a highly esteemed Russian national who was considered a balalaika and mandolin virtuoso. Sheynkman helped Guillermo adapt to the way classical musicians conceive, hear and play their music. Now that Mr. Sheynkman is gone, the quartet consists of three guitarists and a flutist. Festival of Four tours have been long and successful. The group is currently on the roster of the Community Concerts Association. Guillermo has also worked with the great Indian sarodist Aashish Khan and regularly collaborates with Pepe Habichuela on a variety of projects. He lives and teaches in the Los Angeles area and journeys to Spain frequently to visit old friends. Mastery of Technique - Includes 16 sessions explaining and demonstrating how to practice and master the essential flamenco guitar techniques for Alegrias, Tangos, Bulerias, Siguiryas, and other forms. Topics covered are: The Guillermo Rios rasqueado, the "Alzapua" thumb technique, tremolo, 3-fingered picado, speed without tension, developing strength and endurance, the Juan Maya "Marote" rasqueado and the Pepe Habichuela rasqueado. Songs include: "Zapateado Elegante" - a challenging piece for your repertoire. Soleares and Alegrias - presents the flamenco form of Soleares and Alegrias. He explains rhythmic structure, harmonic structure and compositional possibilities, how syncopation is typically used, and some of the choices possible in developing a solid melodic line supported by logical harmony. He also performs some of his own beautiful arrangements here as well. Toques Libres - The Non-Rhythmic Flamenco Tradition - In an artistic and informative program, Guillermo Rios takes us into the world of the "Toques Libres". The absence of a metered pulse in these forms in no way limits their potential musical medium to serve the artist the fullest possibilities. Malaguenas, Mineras, Rondenas, Granadinas, and Tarantas are all discussed. The split screen increases clear views of both Guillermo's hands and he includes performances of his own arrangements in these beautiful flamenco forms.